The Eichholz Law Firm has been collecting non-perishable food items and money to benefit The Second Harvest of Coastal Georgia in a joint effort with other local law firms in the 2018 Georgia Legal Food Frenzy . This is a statewide event, and many Georgia law firms compete against each other to see who can raise the most for their local food bank. This year’s drive took place April 16th – 27th. This yearly event is held by the Georgia Attorney General, the Georgia State Bar, and the Young Lawyers Division. 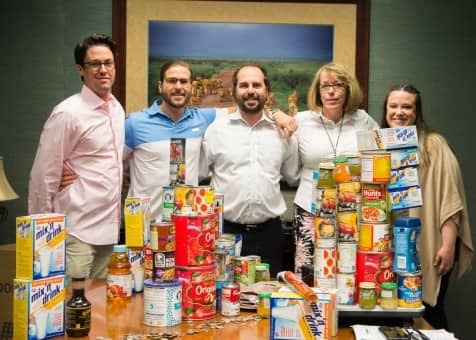 Throughout the last two weeks, employees of the Eichholz Law Firm came together to donate food and money to benefit The Second Harvest of Coastal Georgia . We had departments compete against each other for friendly competition, and to get everyone involved. Some raised money by bringing in donuts and snacks for sale, others had raffles for candy and movie nights. We also had an event each day to keep everyone motivated, including an Ice Cream Social and Loose Change Day where people brought in their loose change. As a team, The Eichholz Law Firm raised the equivalent of over 12,000lbs. of food, with the firm matching all employee monetary donations. Donations made to The Second Harvest of Coastal Georgia help to feed hungry neighbors here in Savannah. Their programs serve as a food safety net for children, senior citizens, low-income families and anyone else who may be at risk for hunger in Southern Georgia. “It’s so rewarding to give back to the community that has always supported us. I’ve dedicated my life to being a lawyer that helps people. It’s so rewarding to have a team that also has the same values to give back to others and support the local community.” says David Eichholz. *disclaimer: Georgia Legal Food Frenzy recognizes that for every $1 donated, it equals 4lb. of food.